XAMPP is a fantastic utility for webdevelopers in various platforms. It works on Ubuntu, Fedora, Windows, Mac etc… A developer will get a same environment and same commands in all operating systems. 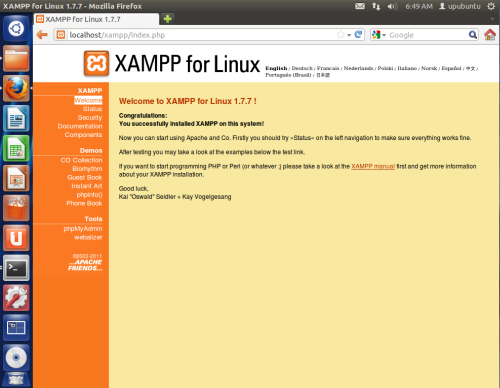 XAMPP is created by ApacheFriends. In Ubuntu 12.04 it is a great platform with power pack. Installting XAMPP is just a breeze. Download the latest stable file extract it to opt and start it. Warning:Please use only this command to install XAMPP. DON’T use any Microsoft Windows tools to extract the archive, it won’t work. NOTE: Replace “username” with your own user name. MySQL administrator username is root without password. ProFTPD uses lampp as password and nobody as user. /opt/lampp/bin/ The XAMPP commands home. /opt/lampp/bin/mysql calls for example the MySQL monitor. /opt/lampp/htdocs/ The Apache DocumentRoot directory. /opt/lampp/etc/httpd.conf The Apache configuration file. /opt/lampp/etc/my.cnf The MySQL configuration file. /opt/lampp/etc/php.ini The PHP configuration file. /opt/lampp/phpmyadmin/config.inc.php The phpMyAdmin configuration file. For more commands and details, check this page. Then restart your computer to kill any running XAMPP daemon.